A 24 hour brine of strong stout beer, garlic and salt is the secret to a moist and flavourful roast turkey. The beauty of a continually borderless society is that it allows people from all over the world to experience a myriad of culinary customs and celebrations which they may have otherwise not been privy too. 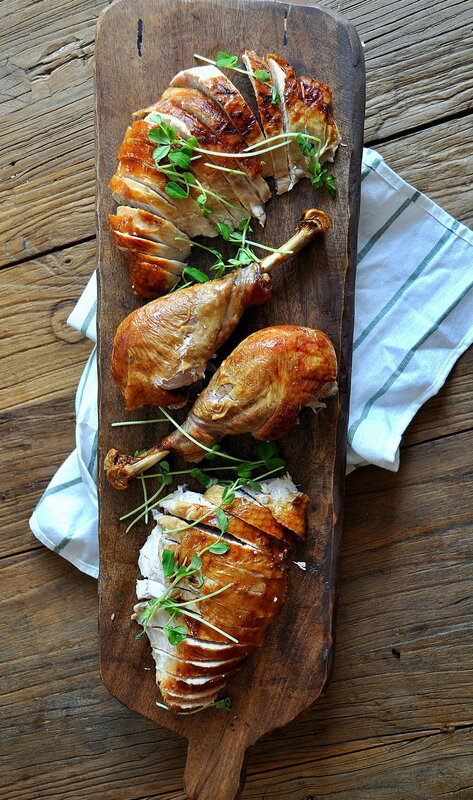 The tricky part becomes, when is the best time to share a roasted beer brined bird that will be awe-inspiring to your dinner guests. In Canada, we are embarking upon my favourite holiday of the year, Thanksgiving. October 12th. It holds the top spot for several reasons. No significant decorations, costumes, treasure hunts or light shows. No politically correct concerns regarding spiritual beliefs. And it is basically 100% food focused. It really ought to come around more than once a year. I started brining turkeys almost ten years ago and haven't looked back. Aside from smoking the turkey, it is the only other way I have been able to achieve truly flavourful and moist white meat while ensuring the dark meat cooks to a safe temperature. The beer brine is a brilliant way to add flavour and the bonus is the alcohol actually acts as a meat tenderizer. For this bird, I used two bottles of a deep, dark oatmeal stout. You can use any kind of beer but the darker, richer and more flavourful the beer, the more flavour your bird will take on. Ideally, the turkey should brine in the beer solution for 24 hours, up to 48. Not only is the meat you carve off going to be noticeably more tender and delicious, the carcass is going to produce a beautiful broth. I know the last thing you want to think about after cooking a huge meal is making another meal but I have a kitchen hack that will change your position on this. Once you have carved your stunning turkey, fire up your slow cooker. Then, toss in the carcass, fill with water and maybe add a couple bay leafs. I take mine to the garage but wherever suits your fancy, set it on low and let it go for at LEAST 24 hours. It is so easy and I have done mine as long as 48 hours. It produces a rich, clear bone broth. Strain it through a cheese cloth lined wire colander and into mason jars or freezer bags. Done and done. So to my Canadian friends, Happy Thanksgiving.... to my American friends, tuck this away for another 6 weeks and to the rest of the world I hope you have an equally fabulous occasion when you can give this Roasted Beer Brined Turkey a go. A 24 hour brine consisting of strong stout beer, garlic and salt is the secret to a moist and flavourful roast turkey. Ensure turkey has completely thawed. Rinse well, remove any giblets and pat dry. 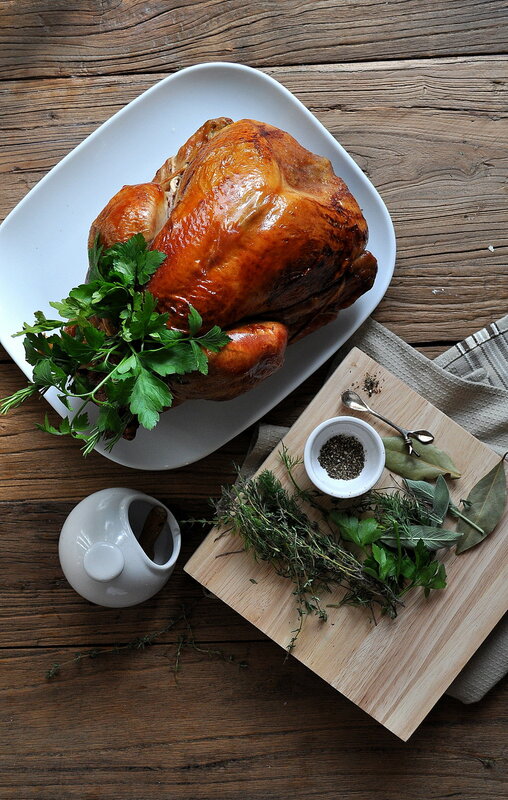 Place the turkey in a large bowl (or deep stock pot) that will allow the turkey to be completely submerged in the brine. 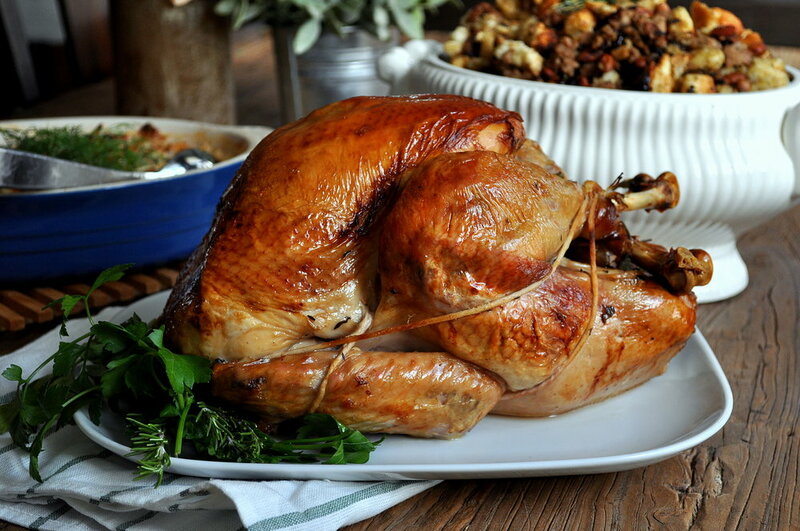 If you use a larger turkey, double the brine amounts and consider using a cooler with ice blocks. Add the beer, garlic (peels and all), onion, bay leaves, salt and water. Let the turkey brine in the fridge (or ice filled cooler) for 24 to 48 hours, breast side down. 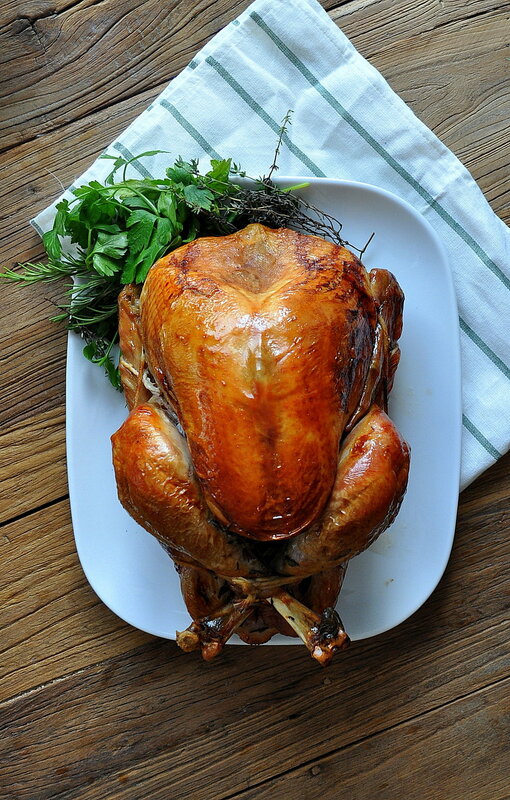 Remove turkey from brine at least one hour prior to cooking. Rinse and pat dry. 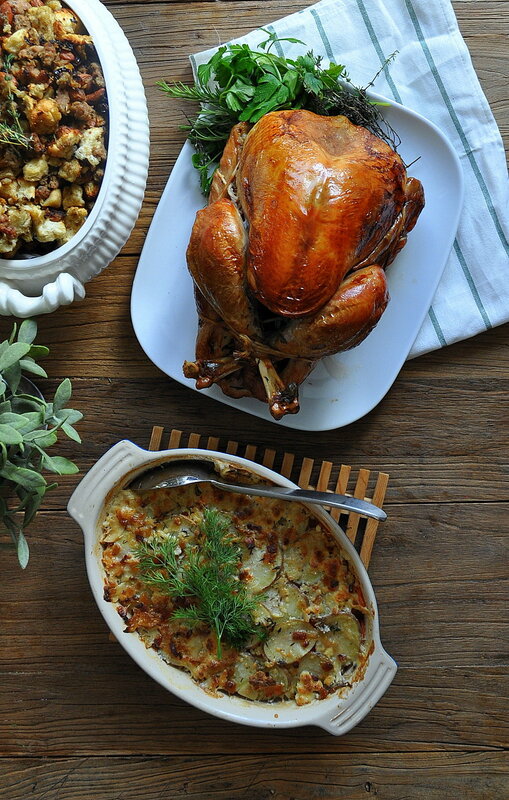 I prefer to truss my turkey and there are great instructions [url href="http://whatsgabycooking.com/citrus-and-herb-roasted-turkey-turkey-101/"]here[/url] from What's Gaby Cooking. Pace the turkey on a rack in a roasting pan. You can a small amount of liquid (water or broth) if you like, just make sure the liquid doesn't touch the bottom of the turkey. Rub the skin generously with some of the butter and stuff the herb bouquet into the cavity. Preheat the oven to 450. My oven gets unhappy at this temperature so I don't go over 425. Keep it on high heat for 30 minutes. Then reduce heat to 350 and roast at 20 minutes at pound or until a meat thermometer reads 165 in the thickest part of the thigh. Rub the skin with butter every thirty minutes for a golden crisp finish. Remove the turkey when done, tent and let rest at LEAST 30 minutes.